Welcome to my St. Vincent Stamp Website! This site has many pages of interesting information about St. Vincent stamps & postal history, as well as information about my other philatelic endeavors. 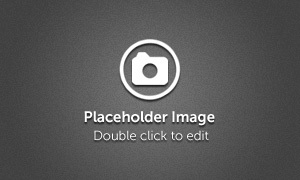 Please use the links on the left side to go to the other pages on this site or to my other websites. 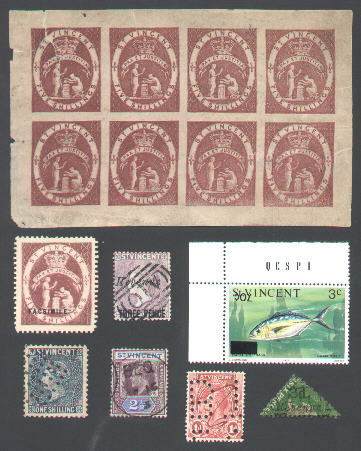 While St. Vincent's current postage stamp issuing policies are criticized by many due to the sheer number of stamps and souvenir sheets issued each year that do not pertain to the island, if one looks past the current stamp issues (which appear to be mostly souvenir sheets), there is a wealth of interesting and very scarce material that one can collect, such as the illustrations on this page show. Complete sheet of 8 forgeries of the 5 shilling values of 1880 and 1888 prior to being perforated and overprinted "FACSIMILE". The forgery is of German origin and includes the word "FALSCH" ("FAKE") in the design. Single stamp of the 5 shilling forgery that is perforated and overprinted "FACSIMILE". THREE PENCE Overprinted Revenue stamp from the 1880's with a fake "A10" cancel. Many years ago, when revenue stamps were not as popular, some of these stamps were given faked "A10" cancels in order to partially obliterate the word "Revenue" in order to fool some stamp collectors into either believing that it was regular postage stamp or that it was used postally (to my knowledge, any St. Vincent Revenue overprint stamp with an "A10" cancel should be considered fake unless on cover). Inverted 70c overprint on 3c Fish Definitive from 1975. Forged 1 shilling postage stamp (with dubious "dot" cancels). Produced by the Spiro Brothers of Hamburg in the 1870's. Scarce "BEQ" cancel (used on the island of Bequia - in the Grenadines of St. Vincent); the first post office on Bequia opened in 1894. "Perfin" stamp from St. Vincent. It is the only one I have ever seen, any information about this would be appreciated! "3d" overprinted and diagonally bisected 6 pence REVENUE stamp from the 1880's (not seen often). Note: See the "CD-ROM" page (http://stvincentstamps.webs.com/cdrom.htm) on this website for information on how to order a self-running CD with over 1,500 scans of the aforementioned items! Do you collect St. Vincent stamps & postal history? No, but will start now! Your poll will appear here. Please feel free to leave comments in the GUESTBOOK! I only check the guestbook about once a month, so any comments requiring a response may take a while; if you have a question it is best to e-mail me directly at "info at stvincentstamps dot com" (replace the "at" and "dot" with the appropriate symbols and remove the spaces, this is done to keep spam sent to me at a minimum). Please note that this is a hobby website of a private individual & philatelist and I have NO connection to the island of St. Vincent, the Government of St. Vincent & the Grenadines, NOR the St. Vincent Postal Corporation (successor to the St. Vincent Postal Services).